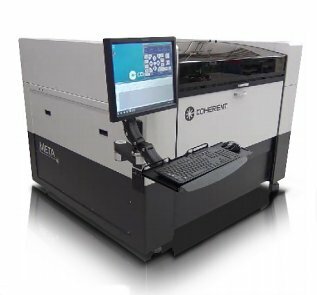 Coherent’s META 2C is a compact and powerful laser cutting machine for high volume and prototype manufacturing applications. The system utilises Coherent’s latest Diamond E250 laser, a 250W pulsed CO2 laser with a fast rise time and a high peak power pulse that is typically 3x above average. It also provides excellent beam quality for high quality cutting. So efficient is the Diamond laser, the META 2C has the processing capabilities of a competitive machine twice its size. With a large 1.22x1.22m (48x48”) cutting area, the system is production ready to cut organic materials such as Acrylic, cardboard, wood and rubber. Example thicknesses include up to 25mm for Acrylic, 4mm for corrugated cardboard and 6mm for hard wood. Cutting thicknesses can be increased by adjusting the process parameters. For the job shop looking to expand its services from organic materials into metal, the Coherent META 2C provides the ideal solution. The system offers a non-contact height sensing and high pressure resistant cutting head option specifically for metal cutting applications. So instead of having to purchase a second laser to handle metal applications, one laser can do the work of two. Using the optional metal cutting head, the META 2C can cut a wide range of thin metals. For example, Spring Steel can be cut at a thickness of up to 0.8mm and Cold Rolled and Stainless Steel up to 0.9mm thick. So whether your workpiece material is organic or metal, the Coherent META 2C can cut both, for a fraction of the cost of investing in a second laser.